A lot of requests from fans of my memoirs I have decided to write other story from skialpinism trip Kamchatka 2009. Today's theme will be very interesting – Czech group landed at Kamchatka and we went on skis to Pacific ocean. Russian vodka. I think, that trip Kamchatka 2009 started nicely. During flight in business class of Aerfoflot (thank you to travel agency www.tucan.sk for incredible price) we became good friends with vodka. 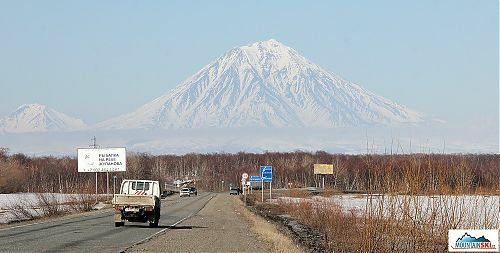 Whole trip is described at: Skialpinism at Kamchatka 2009 – list of articles and photos. Trip was supported by KAMA, Voda hory, Tilak, Quill-outdoor, www.lacnyskialp.sk and Baston.